CES 2013: Gigabyte brings two Windows tablets and a pair of Ultrabooks to market! Since Windows 8 was launched during autumn last year we've had a barrage of tablet computers. They've run Windows 8 and Windows RT, so is there room for a couple more contenders? 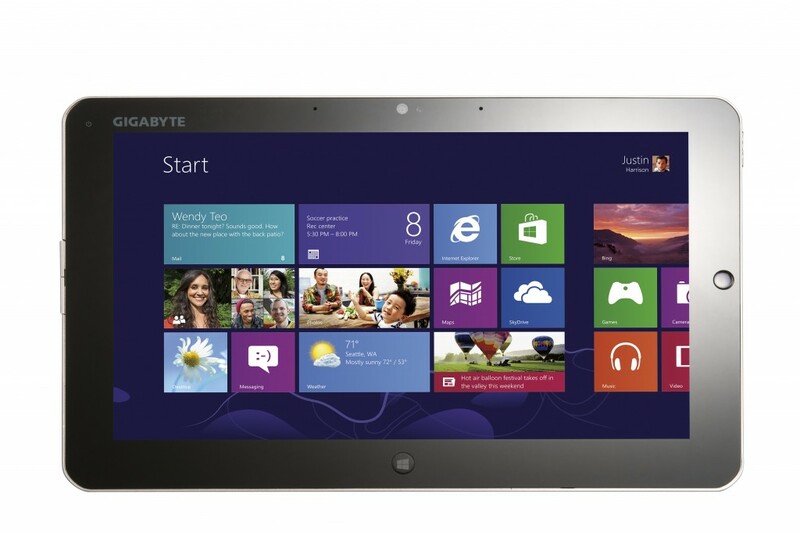 Gigabyte certainly thinks so and here is their brand new S1185 tablet. This device is similar to Microsoft's Surface in that it has an 11.6-inch display, but this one is Full HD and IPS and this tablet runs full Windows 8! 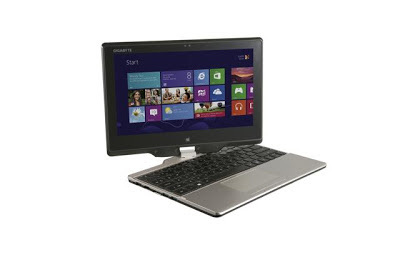 With this tablet you have your choice of 3rd Generation Intel Core Processor configurations and there's standard VGA & HDMI ports, a magnetic keyboard, mouse buttons, Optical Finger Navigation when in the PC mode! You'll also get two lovely cameras, but we don't know the resolution, but at least there's the options there! The S1082 is the little brother of the S1185, think of it as the Ford Focus to the the expensive Mercedes, it'll just get the job done! This tablet has the latest, most energy dual-core Intel Celeron processor on board and your choice of 500 GB HDD or a smaller SSD, something which would be better for business customers, who Gigabyte is targeting with this device! The S1082 also packs a HDMI port, a LAN and a VGA port. You'll also be able to connect it via the built in 3G antenna assuming you have a mobile data subscription! 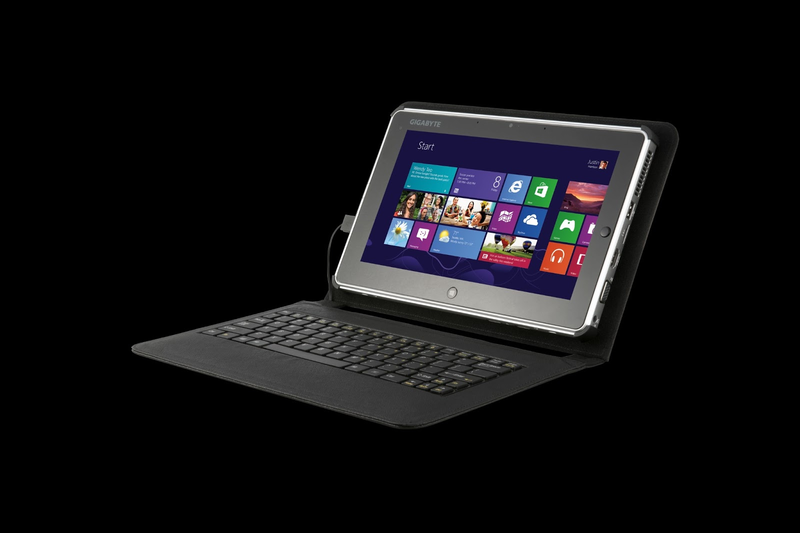 Naturally you can also pick up the keyboard dock pictured above for a little extra money! 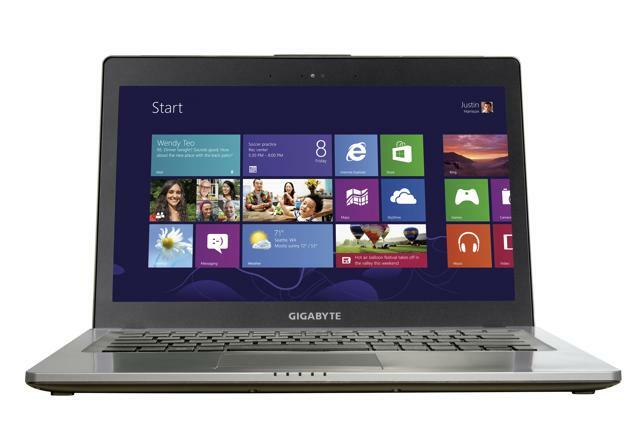 Gigabyte also brought along a couple of Ultrabooks to CES, the first of which is pictured above and is a a convertible laptop come tablet. The swivel hinge, pictured above, is how the conversion will work and it'll be more than powerful enough to handle both your touch and standard computing needs. There's 3rd Gen Intel Core processors available along with an SSD or HDD, depending on your preference (up to 256GB SSD or 1TB HDD), a good set of connectivity options and ports and full Windows 8 running the show. How big is this thing to cram all that in? Well according to Gigabyte it's a mere 2cm thick! There's no word on availability as far as we can see, but it should cost right around $999! And last, but certainly not least, here is the U2442F, a sweet little Ultrabook which is slightly more powerful then the U2142. Again there's a 3rd gen Intel Core processor on board, but this time you get a choice of either the NVIDIA GeForce GT 730M or GT 650M GPUs. Seeing as Gigabyte knows this device will be pushed harder by it's users they have included dual air vents which will supposedly keep the Ultrabook from overheating while simultaneously keeping noise as low as possible because the fans won't be working to their maximum! There's a couple of other cool things here too; the first of them is a backlit keyboard and the second is support for both 128GB SSD and a 750GB/1TB HDD simultaneously! This will give you both a quick boot up time and a good level of storage too! We expect you'll be able to pick up the U2442F for $1,299 next month!